In a strict peer-to-peer networking setup, every computer is an equal, a peer in the network. Each machine can have resources that are shared with any other machine. There is no assigned role for any particular device, and each of the devices usually runs similar software. 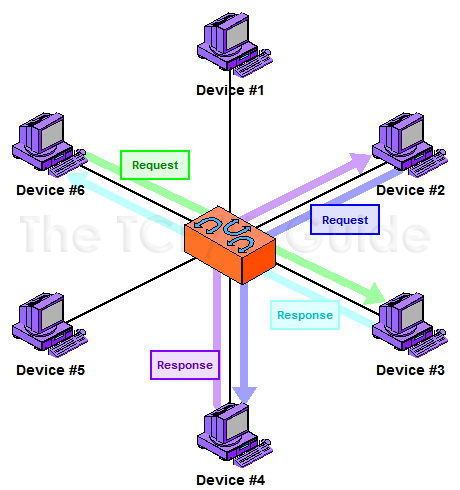 Any device can and will send requests to any other, as illustrated in Figure 5. In this model, each device on the network is treated as a peer, or equal. Each device can send requests and responses, and none are specifically designated as performing a particular role. This model is more often used in very small networks. Contrast to Figure 6.